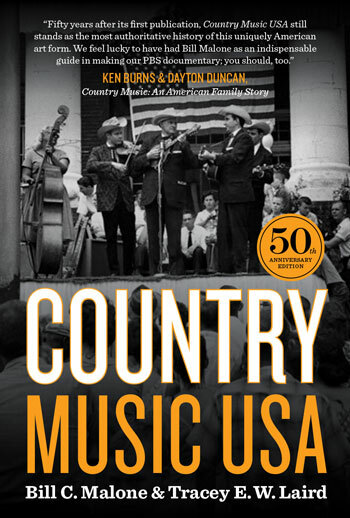 The essential companion to the 2019 Ken Burns documentary on country music, in which Bill Malone appears as a featured historian, this fiftieth-anniversary edition of Country Music USA traces the music from the early days of radio into the new millennium. Since its first publication in 1968, Bill C. Malone’s Country Music USA has won universal acclaim as the definitive history of American country music. Starting with the music’s folk roots in the rural South, it traces country music from the early days of radio into the twenty-first century. In this fiftieth-anniversary edition, Malone, the featured historian in Ken Burns’s 2019 documentary on country music, has revised every chapter to offer new information and fresh insights. Coauthor Tracey Laird tracks developments in country music in the new millennium, exploring the relationship between the current music scene and the traditions from which it emerged. Immersed in country music since his birth, Malone has been both a scholar and a performer of the music for decades. On the fortieth anniversary of the publication of Country Music USA in 2008, he received a Lifetime Achievement Award from the Society for American Music. His other books include Don’t Get above Your Raisin’: Country Music and the Southern Working Class, Southern Music/American Music, and Sing Me Back Home: Southern Roots and Country Music. Laird is the author or editor of four books, including Louisiana Hayride: Radio and Roots Music Along the Red River, Austin City Limits: A History and Austin City Limits: A Monument to Music, the latter coauthored with Brandon W. Laird. She is a professor of music at Agnes Scott College.